To maintain a general level of good health, the American College of Sports Medicine recommends a minimum of 30 minutes of moderate cardiovascular activity five times per week. If you want to drop pounds, you should increase that to between 60 and 90 minutes for those 5 days. Two fitness machines that you can use to complete these workouts are the stepper-type machine, such as the StairMaster, and the treadmill. A review of their features will help you decide which machine best meets your needs and gives you the best calorie burn for your time. The StairMaster is a stepper machine. Steppers come in two models: the older step climber and the newer step mill. The step climber consists of two footplates that are pulled by an internal chain as you shift your body weight from foot to foot. The speed at which your legs go into the descending movement is controlled by the "level" on the control panel; going faster and deeper into the steps creates a more intense workout. The movement is supposed to simulate climbing stairs. The step mill looks like a revolving stair case that you continually climb. You can adjust the rate at which the stairs turn, making your workout more challenging. A treadmill provides you with a ramp upon which you can walk, jog or run. The maximum speed of treadmills depends on the grade of the model. In gyms, expect to find treadmills that begin at 0.5 mph. You can increase the speed in 0.1 mph increments all the way up to 12 or 15 mph. The incline, or ramp, of the belt adjusts in 0.5 percent grades to simulate hills--from 0 percent incline to 15 percent. A few manufacturers produce specialty treadmills that go all the way up to 35 percent and even offer a slight 3 percent downhill grade. The benefit of any workout depends on how hard you are willing to push. 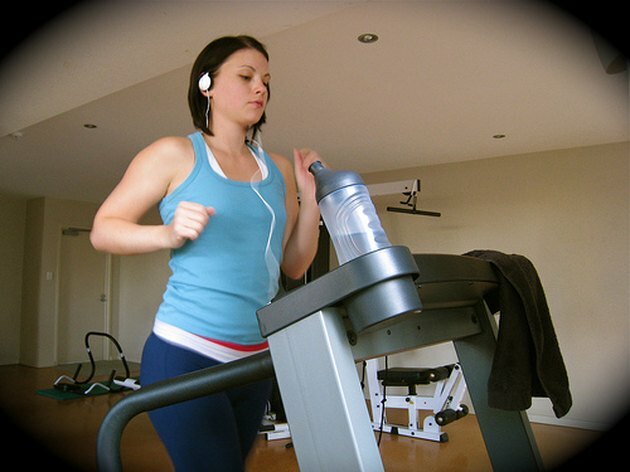 Running at a modest 6 mph pace on the treadmill can burn about 350 calories in a half hour for a 150 lb. woman. In addition, you will tone your legs and improve your overall cardiovascular system. Add a hill or increase your speed to increase the calorie burn. Walking or running up hills also develops your backside. Both stair-stepper machines contribute to cardiovascular endurance and strengthening and toning of your legs and glutes. If you avoid holding onto the handles or console, the StairMaster equipment also improves balance. In just 30 minutes, a vigorous workout--working at about 65 percent of maximum heart rate--burns approximately 250 calories for a 150 lb. woman. You can increase your intensity--going to about 80 percent of heart rate maximum--to bring that burn closer to 400 calories in a half hour. If you have trouble with balance or knee issues, the stair climber may be a poor choice because it causes some loading on the front part of the knee. Those with joint, especially hip, concerns could find the step mill actually intensifies their problems. StairMaster machines and treadmills are beginner-friendly, although walking on a treadmill requires less skill than the weight shift of the stair climber or the rhythmic climb of the rotating step mill. Your body experiences more impact when using the treadmill--especially if you run. If you jump right into an intense workout without building an appropriate level of fitness first, the treadmill may cause shin splints and soreness in the legs. Build up to running with walk/run intervals at first or hikes on a steep incline. Those who are especially overweight might enjoy the StairMaster machines more because they create less impact on the joints. If you are healthy and looking to increase your level of fitness while losing a bit of weight, you should incorporate both stair-stepper and treadmill work into your exercise routine. Cross-training among different machines reduces the chance of overuse injuries and boredom. It also keeps your body challenged so that you do not fall into an exercise plateau. Does Stair Climbing Build Muscle? What Are the Benefits of Incline Walking on a Treadmill?